The Tortilla Series is a work in progress. 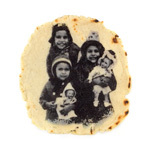 As a German-Hispanic with limited knowledge about her Latina side, I set out to learn about my mother's culture by learning the tactile art of making flour tortillas. As I started into this project I planned to make at least 250, with an end goal of 1,000 tortillas. Currently I am at 534 tortillas and counting. I have also expanded my repertoire to include making corn tortillas and tamales. 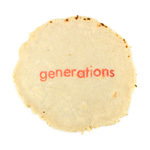 My grandmother and other Hispanic women of her generation made hundreds of tortillas for their large families. Today this tradition has been mostly replaced with the convenience of store-bought tortillas. 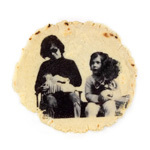 I recently completed the large installation Tortilla Wall, which captures the story of my family making tortillas in a wall installation with forty frames.